The digital force of the company: communication, collaboration and storage to improve your work team’s results. Contact and interact with your team or clients through your mail accounts (Gmail), via video conferences (Hangouts) or by creating a shared document on Drive. Collaborate with your team from anywhere. 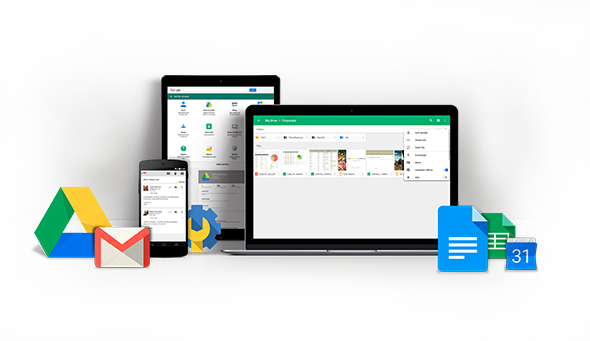 Gmail, Drive and Google Docs create a more productive work experience. Keep all your files in one place and access them from any device. 30GB of on-line storage on line, per user. Add users; manage devices and other settings so that your data is always secure and available. We are committed to working with your company from the beginning, advising you from start-up through new functionality implementation support. Schedule events on your Calendar at times that work for everyone. Get reminders directly to your inbox. With just one click, you can join a video conference through Hangouts and share your presentations to review them as a team. Less preparation, fewer steps. Control the budget control with spreadsheets, share it with the rest of the team and edit it in real time. Since it’s automatically stored in Drive, everyone always has access the most current version. There’s no more need to send attachments to make sure that everyone has the latest version of the document. Thanks to cloud storage, you’ll have all your files in the same place and will have access to the latest version, from any location or device. Synchronize files automatically from your desktop and access them with any device. In addition, you have 30 GB of storage per user, shared between Drive and Gmail; enough space to save a large amount of information/data. Not enough storage? Contact us and we’ll give you more alternatives. Keep your business data protected with device management that allows you to easily locate devices, request passwords, and erase data if necessary. Vault: Review, Retrieve, Search and Export Data.